New York : Penguin Books, 1980. In South Africa, where Blacks and whites are caught in the winds of change, a young woman tries to uphold the radical heritage she received from her martyred parents while carving out a sense of self. The Burger's Daughter was, I think, a good book, but not a great book. The story was interesting--Rosa is a white Afrikkaner and the daughter of two commuist, anti-apartheid, martyrs. The book describes her coming to terms with this legacy and her own place in the world and in South Africa. A story set in South Africa in the sixties and seventies and tells the story of Rosa Burger, daughter of Lionel Burger. Rosa’s parents were Afrikaner Marxists and political activists who opposed apartheid. Rosa loses both her parents to the political struggle. Her dad died in prison. Rosa has no identity of her own and she has no private life. Everything for Rosa is “because I am my father’s daughter” pg 62. He role is imprinted on her. The book explores the impact of apartheid on the people of South Africa. And the society that is racially divided. Rosa discovers that the blacks don’t what the solutions of “well meaning whites”. “ Blackness is the blackman refusing to believe the whiteman’s way of life is best for the blacks. Pg 163” Early in the book, Rosa states in her head that “desire can be very comforting”, she would like to live life without social responsibility and be anonymous like other people. She eventually does get to leave South Africa where she looks for a way to escape her father. She spends some time in France and England only to return to South Africa and her role of ‘her father’s daughter’. I realize that Burger’s Daughter is an Important Book, and that the author won a Nobel Prize for Literature. That doesn’t make me like this book, although it wasn’t all bad. It is the story of one woman’s search for self-identity. Her challenge is that she grew up in the shadow of parents who were famous anti-apartheid activists in South Africa. Part of the story is told in first person narration, and partly by an omniscient narrator; this is one of the techniques that I think works quiet well (the narrator clarifies some of the stream of consciousness rambling of the first person narrator). I had to read this book for the course I am studying this year. Sadly this is a very worthy novel but isn't a novel I will rush to reread. I really didn't care about Rosa Burger and her struggle for identity and I just could not engage with the book. 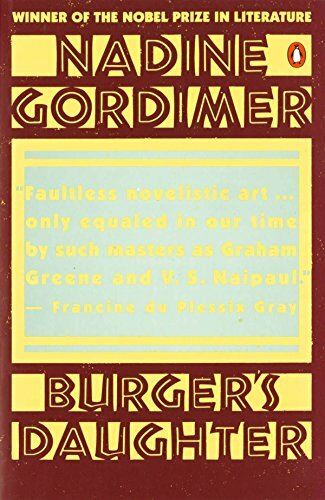 This was the second novel by Nadine Gordimer that I have read; several years ago I read her short novel, July's People. I wish this novel had been a bit shorter, for I did not enjoy reading it. The story follows the life of Rosa, the title character, as she comes to terms with her father Lionel's legacy as an activist in the South African Communist Party over the course of 30 years. The perspective shifts between Rosa's internal monologue (often directed towards her father or her sometimes lover Conrad), and the omniscient narrator. The novel is rooted in the history of the anti-apartheid struggle in South Africa with references to actual events and people from that period. This is a wonderful book. I was expecting something overtly political, not realising that, as a writer living under the Apartheid regime in South Africa, Nadine Gordimer couldn't write anything overtly political. So she wrote something beautiful. And even so, it was banned. The style has elements of Virginia Woolf's experiments with stream of conscious monologue, but the subject matter has far more weight than the things that concerned Woolf. The prose also has the coolness of Hemingway about it, a detached observational stance. The descriptions of place and season, and the way people move through life and among each other, are lyrical without being florid. There is a stillness running through the book that I found strangely comforting. There are no depictions of brutality or activism, nothing visceral or passionate, but the book feels more powerful for that. I felt like I had read something significant. Rosa Burger is the daughter of a white South African Communist imprisoned for his political activity. We only ever meet him in the ways Rosa tries to distance herself from him, and his admirers eulogise him. He was a huge public figure. When he dies, Rosa realises she only really knew the public Lionel Burger. She did not know or really have a father, because Lionel belonged to everyone. The book explores the socio-political struggle of black South Africans without being about that struggle. From the people around her, we learn about the continued struggle. From Rosa, we learn what it is to be the child of a political hero and demon. We hear from Rosa in her one-sided conversations with an absent former lover, as she struggles to explain her life so far and the shadow her father casts over it. We hear about her in the third person, as though described in a newspaper report. We see her through the eyes of the surveillance service who follow her. Without having acted politically herself, she is automatically a named person following her father's death. She is white, she is an Afrikaner, but by the accident of her birth, and her father's political beliefs, she is denied freedom of movement and has expectations placed on her. She is the victim of oppression in different ways to someone black, but she shares their experience. She chooses not to become the person her father's friends and the state expect her to become. Her aim is to keep out of the limelight and obtain a passport. Only by leaving South Africa can she discover who she really is, and even then Lionel is still present. Burger's Daughter My first book finished for the year is for my personal Reading Nobel Women challenge. This was my choice for Nadine Gordimer who is a recipient for Literature, so I read one of her novels. It has taken me a while to attempt to process how I feel about this book. It was difficult to get through because of the nature of the book. For starters, I know relatively little of what was going on in South Africa during apartheid and the anti-apartheid movements. I got the glossed over and sugar-coated versions in school. I knew of Nelson Mandela, even back in school, and what he was known for, but I couldn't grasp it. It was real in that I knew it to be nonfiction but it didn't really exist in my mind. As an American, so far away from South African, I just didn't get it. While I will never understand the full impact of everything involved with apartheid, getting rid of it and getting past it, reading this book began to paint a picture I wasn't familiar with. I was lost for most of the beginning because the topic was so for it's time and place and they were still in the thick of it that I don't think it occurred to the author that it might be necessary one day. Still, I wish there was some sort of forward that was added for modern readers who aren't as familiar with the time that the story begins. Another confusing thing in the beginning was the way it switched from the third person to the first person in some chapters, with the first person being Rosa's internal monologue talking to different people. It was mostly an old lover in the beginning but some others are added at the end. The story itself isn't about apartheid or ending it, so much as this girl trying to live in that time and with her own heritage. Rosa is the daughter of a prominent white Communist who actively advocated for apartheid to end and for the Africans to be complete citizens in their own country. He is believed to be based on Bram Fischer. What makes the book magical in its own way isn't so much the story itself but all the little observations of Rosa when she is in the first person. She occupies a strange place in the history of South Africa where she sees things about the status of the places that other's within the story don't see. It’s not peace at any price, it’s peace for each at his price. White liberalism will sacrifice the long odds on attaining social justice and settle for letting blacks into the exploiting class. The ‘enlightened’ government crowd will sacrifice the long odds on maintaining complete white supremacy and settle for propping up a black middle class whose class interests run counter to a black revolution. It's just one piece of a larger conversation about whether or not the black who were invited to box with the whites at the Olympics and what it means for everyone. Is it progress that they are being invited? Is it a stall tactic for the whites who are in power to not have a full on revolution? And then what does it all mean when you take a second and look back on your own country's history? It sent me in circles for days thinking about how things work in the US and whether or not this person was on to something and what it would mean for everyone if it really worked this way. Passages like this happened several times in the book. Rosa was a great character, not necessarily because she is likable but because she isn't always likable. A character shouldn't always have to be likable. Sometimes they are going to do disagreeable things, just as people do, if they are to be true to life characters. Her world and her problems were interesting and foreign to me and it was completely understandable to me for her to feel every way she felt, even when it resulted in her doing things I didn't think were a good idea. The most relatable thing about the book, especially right now with the way so many people are feeling in the wake of the US's own recent political upheaval, was the way Rosa doesn't like her lot in life as one the "named" from birth. She has no chance for a normal life because of who her parents were but she also doesn't appear to want what a normal white girl there were have because of how her parents raised her. She spends most of the book in a place of hopelessness about how apartheid will never end. I can imagine that given the time it took, many people felt that way.